If there is any cancellation on some nights during the stay, there will be cancellation charge of Rp. 50000 per night per person. -Kuta Beach is just 10-15 minutes drive(approx 20-30K IDR with online cab) and can be reached by walking. -Airport is just 10 minutes away and we are on the fastest route to airport. From hostel to airport it costs only 25-30K IDR with online taxi. While from airport to hostel, with airport taxi it costs approx 125K-150K IDR. Or email us for airport pick up arrangement at similar price. -We provide free drop twice a day to the airport and Kuta beach at 11 am and 5 pm as a way to bring the best we could give for your stay. -Access to Ubud for solo traveler is so easy, as we are next door to Shuttle Bus station to Ubud. -Next door to 24 hours minimart, and Hypermart for fresh fruit and all you need. 2 minutes walk. There are movie projector, tv cable, free internet and computer, pool table and games to play and make you feel home. A free washing machine available to keep your backpack at good shape. Simple breakfast is available start from 15K. As for party, we are 17 minutes from Legian party lane(Sky garden and others), can be reached by walking. That way you can have a nice party and a good night for rest. We work by heart to ensure that We Offer Right Things for your stay. We are team of young energetic educated people who love to share and make new friends. We try to do each little thing with great love for your stay. We try to present you the beauty of our country through our service. CONVENIENT is the location. COMFORT and CLEAN is the bed for your good night. STYLISH and FUNCTIONAL is the room. NICE and COOL is the roof top public area for you to gather and make new friends and as well as for occasional in-house events. FAMILIAR and FRIENDLY is the ambiance we build. Unforgettable memory and satisfaction of your staying is our honor. And at the end .. “Home” is the way we wish you may name us at the end of your staying. • We have 3 floors, 2nd and 3rd floors are for beds along with shared bathrooms and toilets, and 4th floor is the public area. • All floors are connected with elevator and monitored by CCTV. • You will get Individual secured key card for designated floor, room and locker for your security. 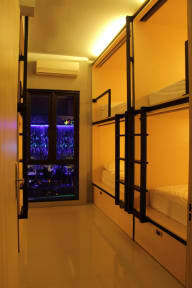 • We also provide female-only rooms, accommodated with dressing up corner.